It’s now easier than ever for a thief to take one of the most valuable things you have: your identity. The internet has its great advantages but it also produces a number of risks in terms of how easy it is to acquire your personal information and use it fraudulently. Trusted ID thinks it has the answer, offering a range of detection and protection services, as well as extra data breach services should the worst happen. Trusted ID is one of America's foremost ID theft protection services, providing hundreds of thousands of Americans with peace of mind every year with a range of features which are devised to ensure that they can be confident that their identity and financial information are secure. 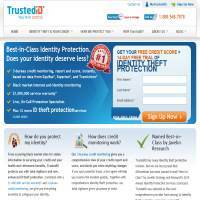 trustID.com offers three key forms of identity theft protection services. The first is defensive, protecting thieves from accessing your data in the first place. The second is a detection service which alerts you to any threats, and the third is a form of recovery, which aims to reduce the negative impact that any stolen information might have on your life. The defences it puts up mainly focus on removing your name and information from various databases, such as black market sites, or making sure that you have the correct settings on social networks so that your vital data isn’t easily accessible. The system performs a variety of reports on your ID including 3 bureau credit reports, which you can view instantly. This makes sure that your account hasn’t been used to apply for new credit cards or that online spending hasn’t occurred without your authorisation. Finally you have protection if things do go wrong, such as losing your wallet. The site’s team of professionals will help you to cancel your cards, and can even provide monetary cover for expenses (such as lost earnings) if your ID has been stolen whilst under their protection. All of this is well and good, although TrustedID doesn’t say a great deal about its data recovery policies outside of the data breach options, which cost extra. If your identification is stolen, what measures do they take to help you recover from the theft? Do they take measures to recover the data and remove any black marks that have been made against your name? This can be very important, not only for your public profile but also because a bad credit rating might mean that you won’t be able to get loans in the future. We’d appreciate more information as to the specifics of the company and what they do to help you out when their protective systems don’t always work. Of course, you will receive extra attention if you partake in the data breach services, but these cost extra and the prices are only available by quotation. Those things considered, users do have access to a complete 3-in-1 annual credit report (compiled with data from the three major US credit bureaus Experian, Equifax and Trans-Union), through which they can examine annually any unusual credit transactions or applications in their name. Trusted ID also has web-scanning technology which is intended to scan public databases and data trading websites for instances of a user's credit card details, bank account details, name, address or social security number, appearing on such sites. This allows users to know in advance if their data is being traded online, giving them an early indication that they could shortly become a target for identity theft or associated fraudulent activities. Users can also opt to be removed from the pre-approved credit register, to ensure that they do not receive innumerable credit card offers through junk-mail drops. Not only does this remove the inconvenience of such soliciting, it also closes off another important avenue for identity thieves to get hold of your information. If you’re looking for more information on how to protect your identity from theft then there is an exclusive blog on the site. This includes relatively recent updates on issues such as tips for senior citizens and travellers. The posts aren’t particularly long, though, and would benefit from expansion or links to further resources. You can also see some ID theft statistics on the blog, although they do seem more of a tool to coerce you into getting protection and don’t necessarily serve a great purpose otherwise. TrustID seems a legitimate company that offers a decent service. It doesn’t have quite so many features as other identity theft protection websites around, and is somewhat lacking in information at times, but it does offer a 14 day free trial and reasonable prices for individual or family protection.